Stock up on food and block all the entrances, the zombie horde is coming! Yu-Gi-Oh! TRADING CARD GAME Structure Deck: Zombie Horde builds upon the all-encompassing power of the Zombie World Field Spell to create Duels where Zombies reign supreme! To ensure that you’ll always have Zombie World at the ready, a new, high-ATK Level 4 monster protects Zombie World from being targeted or destroyed by card effects, and if you don’t have Zombie World at all, you can banish this monster from your field or Graveyard to activate the powerful Field Spell straight from your Deck or hand! This Deck isn’t just about one or two Zombies, it’s about a whole horde of zombies! And the scariest thing about a zombie horde is that its sole purpose is to make you join it! A brand-new Spell Card for any kind of Zombie Deck lets you conscript your opponent’s monsters into your horde not once, but twice! The effect of the classic Change of Heart Spell Card is yours – as long as you control a Level 5 or higher Zombie – and you can shuffle one of your banished Zombies back into your Deck to Set this new Spell from your Graveyard back to the field! 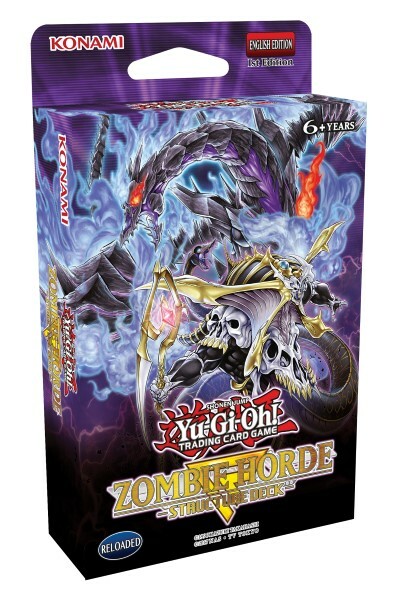 2018 has been a great year for Zombie Decks with brand-new strategies in both Yu-Gi-Oh! TRADING CARD GAME Dark Saviors and Yu-Gi-Oh! TRADING CARD GAME Hidden Summoners, and this new Structure Deck is poised to continue the latest Zombie outbreak in the Dueling world!